In simple language, DevArt is art created using codes. DevArt uses technology as their unbleached cloth and codes as their paint to give life to amazing and magical digital art installations. DevArt is a part of a larger exhibition named Digital Revolution, which looks at technology’s influence on films, video games and other creative media. Here are the top 10 entries to this exciting exhibition. Have you ever thought about sharing your innermost wishes to the world? Now imagine your wishes turning into a beautiful, magical butterfly. Sounds pretty cool right? With the Wishing Wall, you can now share your wishes with the world. Share your wishes to a microphone, which will then be transferred to the system after which a beautiful butterfly magically appears. Every butterfly will be released as soon as it is captured or it is allowed to land on someone’s arm. This is definitely a boost to all those technology creators. Co(de) factory enables creators from different parts of the world to create individual physical artifacts using a set of custom made in-browser 3D modelling tools. By using light flashes to expose UV hardening resin, objects will develop from liquids in an amazing way. The main advantage and feature of this art is that it encourages re-use of the same idea which leads to innumerable possible outcomes. This is a personal favourite. Les métamorphoses de Mr. Kalia helps in understanding the concept of metamorphosis. Human bodies face large number of emotional changes- physical and mental, biological and artificial, and at times it is extremely difficult to understand cope with these changes. Mr Kalia, represents these metamorphosis’, which will convey these feelings of change. Mr Kalia can be operated and brought to life by you, through skeleton tracking system. 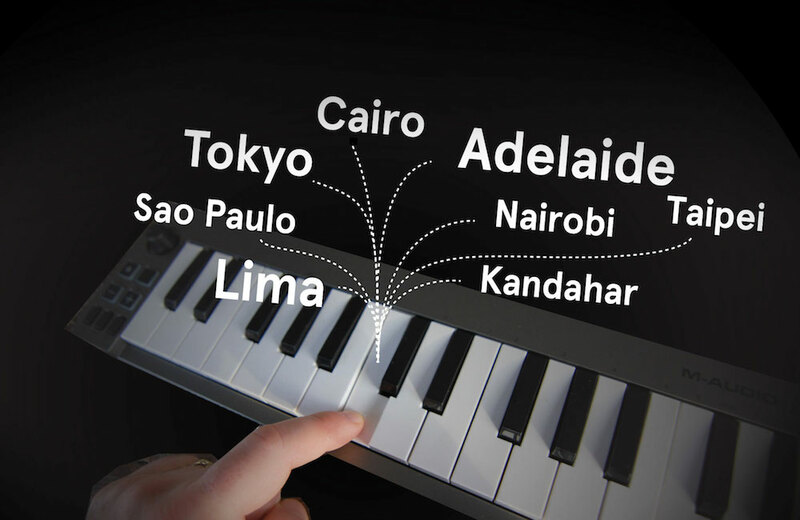 All those music lovers out there, here is your chance to play a keyboard that finds samples of the same note from web radio stations from around the world. There’s more! The installations will have speakers in round and audience will listen to sounds in a geographic orientation,thus highlighting the enchanting global surround system. Have you ever wanted to visit other people’s dreams? Sounds like a complete fantasy doesn’t it? Well, now you can do it through the Dreamsprawler. This creative art aims at mapping people’s dream on a brain. People can carve their dreams on to this brain either through text, images, voices or videos. This data will then be uploaded in to Google+ under the hashtag #Dreamsprawler. This application will then allow users to revisit other people’s dreams. In this digitally-driven world, the Kit de Libertad de Expresión or the Freedom of Speech Kit helps those who conduct social demonstrations. This kit helps reduce the gap between social networks used for citizens’ organization and the collection of ideas in a demonstration. Now children too can use Google Maps to play. The Giant Map is an extremely large and interactive Google Map, which enables children to physically play. The children’s movements makes the map change dynamically. So the next time your children wants to roar like Godzilla, make sure you use The Giant Map. This art helps create various haunting,unique and artificial faces from a hidden research list of real faces. The diversity and minuteness of each face from The Face Cloud increases with every entry, and users are free to add their faces into this database. This is done using standard face recognition algorithms. For all those who would want to learn the nuances of generative abstract art in a quick and simple way, here is your chance. This art allows users to manipulate those that are only allowed to be viewed. Sounds interesting? Well, you have the option to either explore around a piece or generate something new from a new location. The choice is yours. This piece is a continuation of Sunset, which describes the sunset seascape in all its magnanimity. The piece is ideally meant to be available continuously for long periods of time. 1Click is the best live chat solution for businesses. Cloud and webRTC based our video calling software lets businesses customize the web conference rooms, record video calls, multipoint face to face video chat without any software installation, and cross-platform video conferencing so that one wouldn’t worry what OS the other person is using. Our video plugin, video calling API and SDK enables video, audio, and text on any website or mobile app. Video web conferencing has never been easier before. Experience the power of real time communication on your browser through 1CLICK. Few business application: video interviewing, online sales demo, live streaming, sharing tutorials, education & research, remote web conferencing, telepresence, teleconference, video call recording, enabling two parties on your website or platform interact, video customer relationship management (video CRM), customer service, video FAQ, video captcha, and so on. This entry was posted on July 4, 2014 by Deepthi Ramdas in Events and tagged Google's DevArt exhibition.